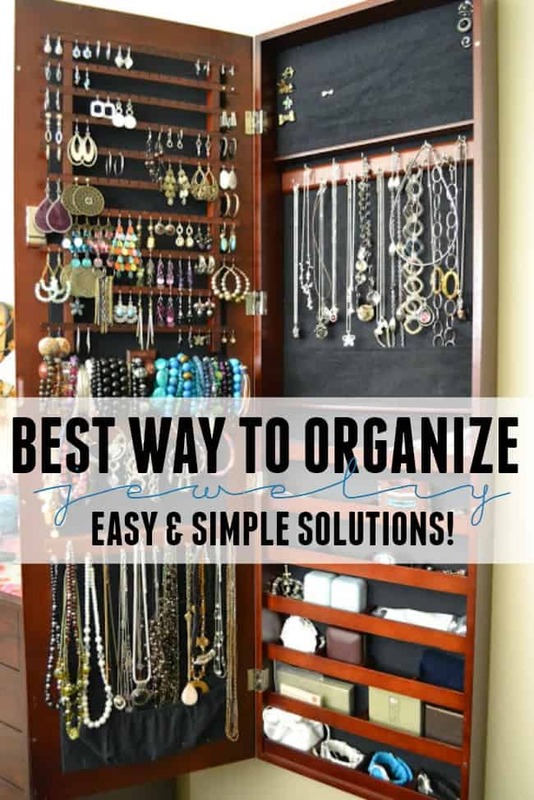 Best way to organize jewelry with style and function! 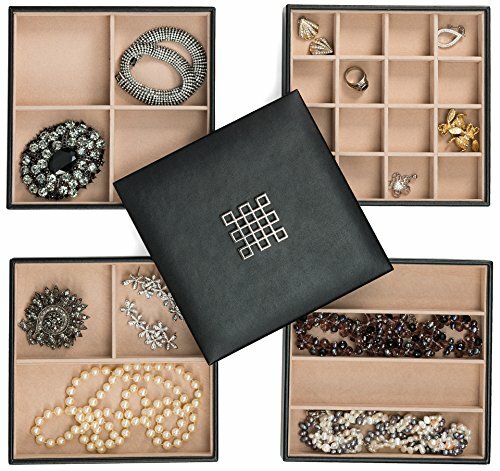 Learn the best way to organize jewelry. Check out these easy and simple solutions to fix that mess of tangled earrings, necklaces and more. Nothing can make you want to skip putting on the jewelry like having a tangled mess of necklaces, missing earrings and the overall just bad organization. The New Year always makes me want to clean out, especially with all the new stuff brought in from Christmas. So, of course, there is no time like today to find the most creative and best way to organize jewelry. 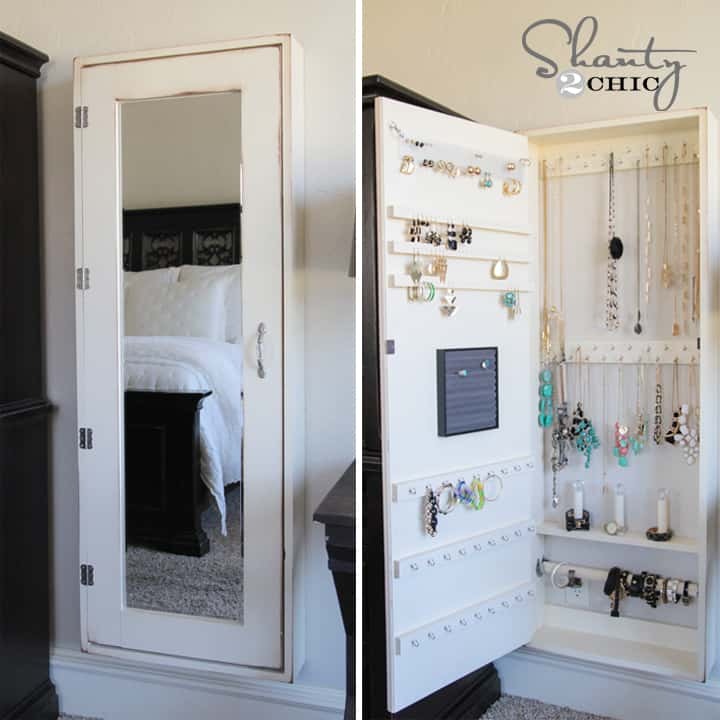 One of my favorite ways to store jewelry is with a wall mounted jewelry armoire. 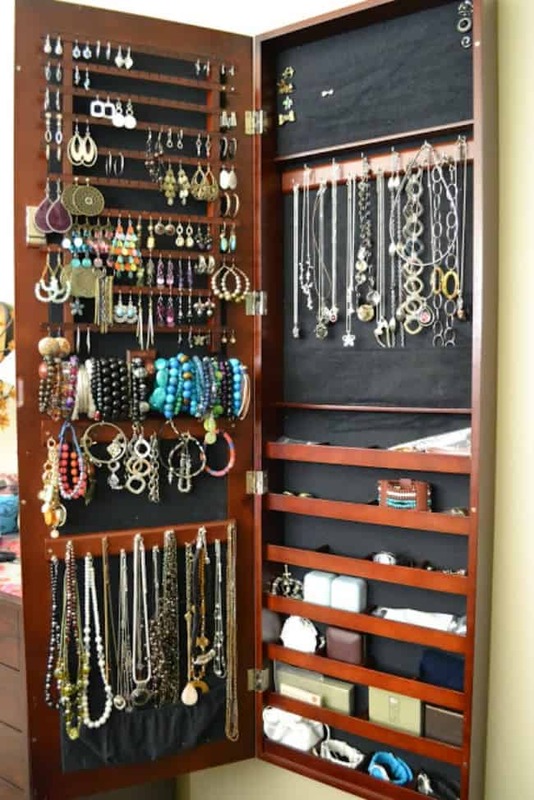 It is in my opinion, simply the best way to organize jewelry at home with all kinds of space for necklaces, rings, earrings and more. 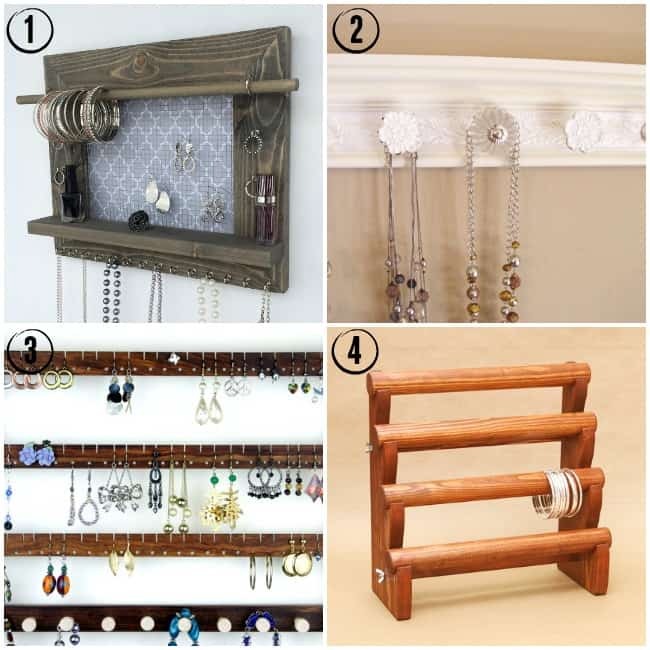 If the wall mount style organizer is a little too pricey then how about a homemade jewelry organizer? The girls over at Shanty2chic give you all the step by step details to making this beautiful piece. Of course, building isn’t always a solution for everyone so if you are still looking for your best way to organize jewelry here are a few more great options from some very talented Etsy sellers. 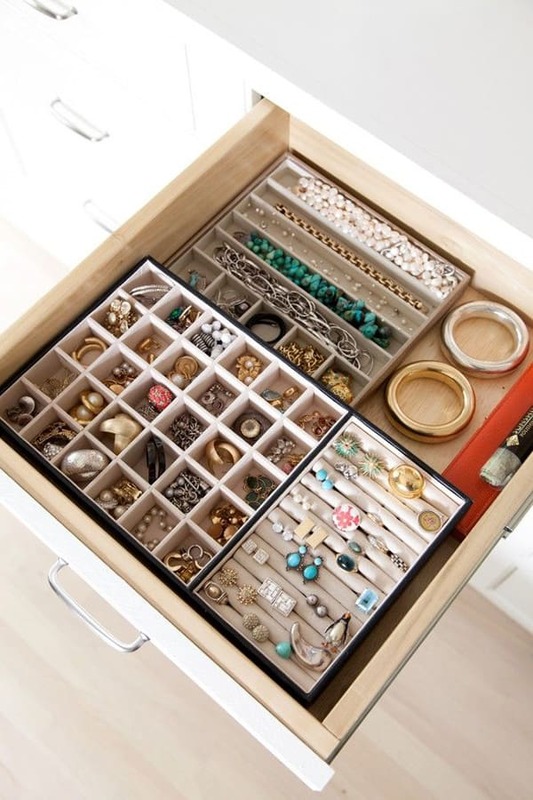 So you don’t have the wall space and you are wondering what is the best way to organize jewelry in drawers? First, you will want to identify what you have and then decide what actual types of drawer organization you need. 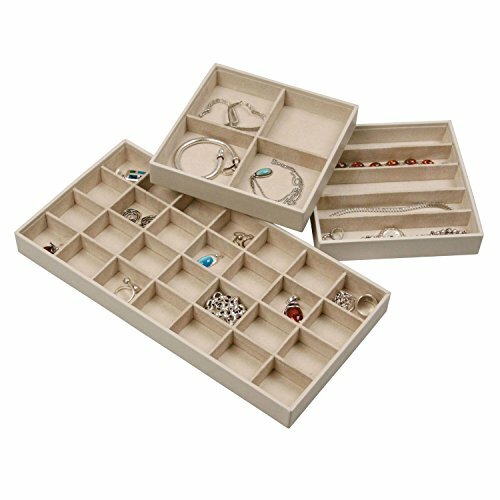 Look for drawer inserts equipped with compartments and slots that sort your jewelry by type. You can even repurpose kitchen drawer cutlery holders, colorful ice-cube trays, or dividers. A few of these simple drawer organizers for jewelry can do the trick. Annie Silke from Fresh American Style makes these drawers look so spot on. Store everything so you can visibly see your jewelry. By doing this you can easily do a visual inventory. This allows you to see when something has gone missing or know that you already had 3 pairs of similar dangling earrings and don’t need another. If you can’t see them easily, they might as well have gone missing. Out of sight out of mind is a bad thing when it comes to jewelry. Here are some similar ones that would work great for organizing your drawers. How to break free from the scale!